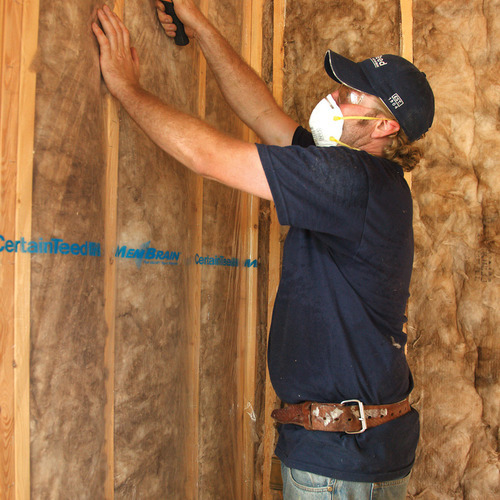 Water vapor molecules can pass through gypsum wallboard even when the wallboard has no holes. This water transport mechanism is called vapor diffusion. Building scientists talk about several different moisture transport mechanisms. Most of these mechanisms — for example, water entry due to a roof leak — are easy to understand. Other transport mechanisms, like vapor diffusion, aren’t quite as intuitive. First, some basic definitions. Water vapor is water in a gaseous state — that is, water that has evaporated. It is invisible. Water vapor diffusion is the movement of water vapor through vapor-permeable materials. Vapor diffusion happens through a solid material even when the material has no holes. 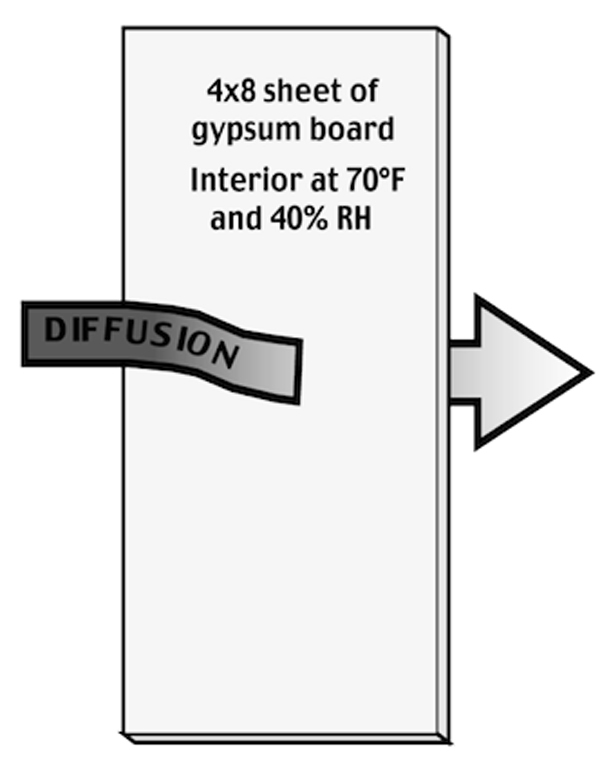 A typical example of vapor diffusion happens when a material — for example, gypsum drywall installed on a wall — separates two zones. If the air on one side of the drywall is very damp, and the air on the other side of the drywall is very dry, moisture in the air will diffuse through the drywall. To understand how this happens, imagine how drywall takes on water when it is damp. On a dry day in Arizona, drywall is crisp. When scored with a sharp knife, it can be easily snapped. However, if a sheet of drywall is left for a week lying flat on a damp basement slab in Vermont, it gets limp and noodly. 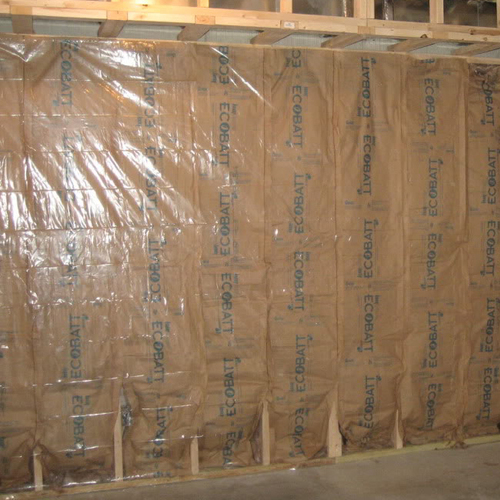 Drywall absorbs moisture like a sponge from either face, and it also dries out readily from either face via evaporation. If the drywall is screwed to a stud wall that separates a damp area from a dry area, the drywall absorbs moisture on its damp side. Moisture evaporates from its dry side. The moisture has moved through the drywall by diffusion. Martin - Thank you for a nice list of perm ratings. Mineral wool and cellulose are rated the same. Should dense pack have an "asterisk" due to its ability to hold moisture, or does that effect or property of cellulose not officially play into permeability? In short, the sorption isotherms is where you'd see the difference you're asking about, not the permeance. The lab technician who performs the ASTM E96 dry cup test has some latitude in determining the thickness of the test specimen. In the case of cellulose insulation, some method of supporting the material must be used (since the material has to be installed on top of a cup filled with desiccant for the test). I'm not sure how lab technicians do this when testing cellulose, but I imagine that the test specimen is supported by something like insect screening. Here is further information on the test procedure: "Two of the methods to test the water vapor transmission of a material are desiccant (dry cup) and water (wet cup). These two tests are similar in setup but the service conditions are different and the results are not comparable in any way. The dry cup is designed to simulate a heated dry building during a pouring rain, measuring the drive into the building. The water, or wet, cup measures the vapor drive moving in the opposite direction. "For assembling these tests ..., the desiccant or water is placed in a dish leaving a small gap (0.25” to 0.75”) of air space between it and the material. The test chamber is maintained at a constant temperature of 23°C (73.4°F) and a relative humidity of 50 ± 2%. An initial weight is taken of the apparatus and during the course of the test the weight change of the complete test assembly is measured until the results become linear. "The water method assembly measures weight loss due to water vapor from the cup transmitting through the material to the test atmosphere as well as the humidity of the test chamber. "The desiccant method assembly measures weight gain due to water vapor from the chamber transmitting through the material due to the desiccant absorbing any moisture from the material sample and the humidity from the test chamber that is being absorbed by the material. "Based on the equilibrium change of weight, a water vapor transmission value is calculated, which provides an average permeance for the tested material. The product’s permeability may be derived from this calculation as well as if a material is permeable or non-permeable." According to another source, "The water or desiccant is placed on the bottom of the dish within 1/4" of the material being tested which is attached to the mouth of the dish. The test chamber is maintained at a constant temperature of 73.4°F and a relative humidity of 50 ± 2%. During the course of the test, the weight change of the test assembly (material, cup and contents) is measured. The water method assembly will lose weight due to water vapor from the cup transmitting through the material to the material absorbing moisture from the material sample as well as the humidity of the test chamber. The desiccant method assembly will gain weight due to water vapor from the chamber transmitting through the material due to the desiccant absorbing any moisture from the material sample and the humidity from the test chamber that is being absorbed by the material. Based on the change of weight, a water vapor transmission value is calculated for materials using both methods. "The designer or specifier shall ensure that when comparing WVT values of multiple materials, they are always comparing the identical methods of this test (water or desiccant). The best practice for the industry is for manufacturers of a fluid-applied material to list the WVT thickness at their specified installation thickness as the thickness of the material will determine the WVT value obtained. "When reviewing a test table of WVT of thickness and values of a material, there may be a correlation between the two but the results are not linear. Therefore, if a material was tested at 'X' thickness and the WVT is 'Y', a designer cannot calculate and/or assume that if a material was specified and applied at half the thickness the WVT will be double, or if the thickness the WVT is double the WVP will be halved." From the information in these sources, I'm guessing that the thickness of the cellulose samples used in the ASTM E96 dry cup tests leading to the values in the table are relatively thin -- too thin for the hygric buffering characteristics of cellulose to affect the results. The question of how long the test must be performed is complicated, and subject to some judgment by the technician. 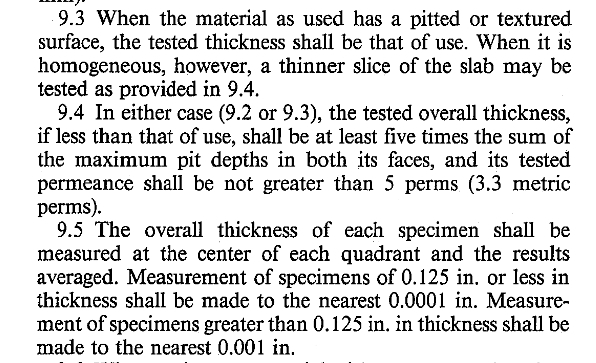 ASTM E96 notes, "For low low permeability materials, this method can be used to determine the results after 30 to 60 days..." so clearly the test can sometimes take quite a while. The idea is to calculate a rate, so a time measurement is a necessary part of the calculation. But the rate calculation isn't simple. ASTM E96 notes, "A mathematical least squares regression analysis of the weight, modified by the dummy specimen when used, as a function of time will give the rate of water vapor transmission." Allison and Martin - Thank you for your attempted answers. I can now say,tongue in cheek, " Oh, that clears it up." I did reread Allison's article, and figure that cellulose is more like the wood, and mineral wool is (relatively) more like the brick on those graphs. My point is that permeance (not permeability) is measured by a lab test, and the lab test procedure is set out in ASTM E96. 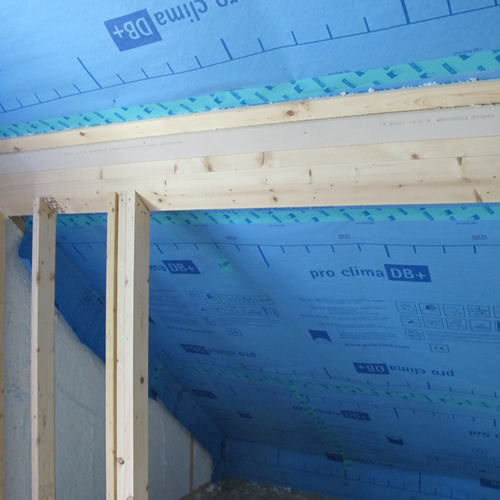 Once you know the permeance of a material -- for example, cellulose -- you have important information to determine how that material will perform in a building assembly. But knowing a material's permeance doesn't tell you everything. It's useful to know a material's R-value per inch, for example. And (as you point out) it's also useful to know if a material acts as a hygric buffer, as cellulose does. A good designer takes all of this information into account -- permeance, R-value, hygric buffering characteristics, installation requirements, cost, and availability of contractors able to install the materials -- when designing a wall assembly. 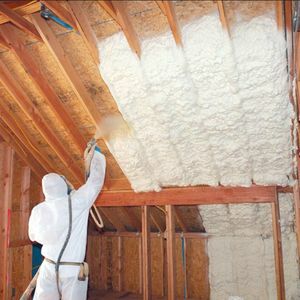 Martin, combining a couple of your past article subjects - I am in the process of prepping for doing a retrofit insulation upgrade to a 100 year old wood framed home with clapboard siding in south Georgia that currently has no insulation. My plan is to use mineral wool batts between the studs with an interior layer of 1.5 inch polyiso board covered with airtight 1/2 inch gyp bd. I plan on using fiber faced polyiso board - which according to your chart has a very high permeance. Seems like this would be be a very forgiving wall and would dry well to both inside and outside. is there any downside to not using a foil faced polyiso bd in this situation - seems like the fiber faced would be a better choice? 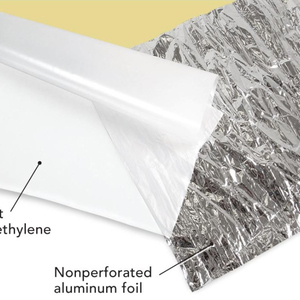 Any air barrier differences between the two products (foil vs fiber faced polyiso)? Although my table lists a permeance value for unfaced polyiso, it does not list a permeance value for the product you intend to use (fiber-faced polyiso). There are several types of "fiber facing," and I'm not prepared to generalize about the vapor permeance of these products. The best way to determine the vapor permeance of the insulation you'd like to use is to contact the manufacturer. 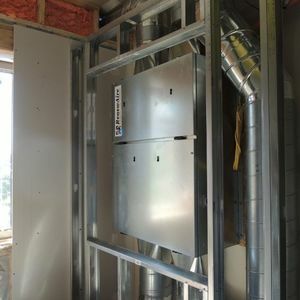 That said, I wouldn't worry too much about the vapor permeance of the the interior rigid foam that you intend to install -- as long as your wall assembly can dry to the exterior. For more information on this type of wall, see Walls With Interior Rigid Foam. Thanks, Martin. Another insightful post. On paint: clay paints and limewash seem to come in as excellent vapor-permeable products. They seem even to play nice with gypsum board, yielding an interior wallboard system that keeps vapor moving effectively. Any word on MGO board in this context would be appreciated. At least one MGO board importer (Extremegreen) is indicating on its Web site that gypsum board is not vapor permeable! Makes me not trust them, to be sure. The image below has values for the vapor permeance of MGO board. The source of the information is this document: "Moisture damage with magnesium oxide boards in Danish facade structures." That seems unlikely, but that's what I get. The values in the table are in fact in ng, they just chose a really weird way of expressing it, which is x10^-12 kg. Assuming the conversion equation is linear, that would make it 0.9 perms. I tried to look up the conversion, but couldn't immediately find anything that made sense. I started reading about mass in grains, and my head started to hurt. Why does anyone still use such bizarre measures? Good catch -- I missed the heading at the top of the column. (I knew something was wrong with my conversion, which is why I displayed my faulty math, hoping a GBA reader would help me out.) Thanks. So let's call it 0.9 perm. It's a Class 2 vapor retarder, like kraft facing.